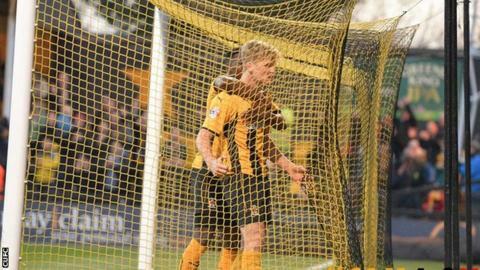 On-loan Cambridge United midfielder Cameron McGeehan hopes he can do enough to extend his stay at the club after making a goalscoring debut. The 19-year-old, a one-month signing from Norwich, netted twice in Saturday's 4-0 win over Newport. And he is available for Friday's FA Cup tie against Manchester United. "I'm not looking to do well to get back to Norwich, I'm looking to stay here and hopefully push up the table," he told BBC Radio Cambridgeshire. "Being part of the Man United game is something amazing as well. "I've really enjoyed it so far. I've got to keep myself in the team and hopefully stay as long as I can and get League football." Northern Ireland Under-21 international McGeehan spent the second half of last season at Cambridge's local rivals Luton Town, helping the Hatters win the Conference title. And the ex-Chelsea and Fulham youngster, who captained the Canaries to FA Youth Cup success in 2013, could face friend and former Molesey under-sixes team-mate Luke Shaw when Manchester United come to the Abbey in the FA Cup fourth round. "I grew up with Luke Shaw, he's from my area and is a close friend of the family," McGeehan said. "There may be a few texts and jokes. "I've also played a lot with Paddy McNair with Northern Ireland. So that will be interesting."